We’ve all been there. Your child’s pacifier has fallen on the floor and you’re frantically trying to find your way to a restroom to wash it off so your poor baby doesn’t contract some horrible disease you’ve made up in your mind. 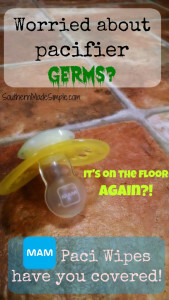 I think there comes a point where you become a little more lenient about putting a paci that fell on your own carpet in your own home back into their mouths, but there are serious and legitimate situations where you need to be very cautious about putting a germ-y pacifier back into their mouth. Maybe your child dropped their paci on the floor of the bathroom, or perhaps it fell into the dirt at the ballpark. Maybe another child decided to share their slobber and paci-swap with your child. MAYBE your baby was fussy so you dragged a paci out from the bottom of your diaper bag only to discover it’s covered in lint and cheerio crumbs. Yeah, I’ve seen plenty a crusty paci creeping from the abyss of my diaper bag a time or two. It ain’t pretty. But worry no more, fellow members of the crusty paci club! MAM, (my FAVORITE pacifier brand of all time) just made our lives as parents so much easier! They recently launched MAM pacifier wipes to help us combat those nasty germs and keep our baby’s pacifiers clean. They come in a resealable (thank you!) and portable package that fits perfectly in any diaper bag.